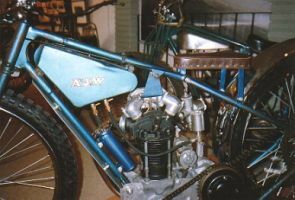 The AJW "Speedfox" with JAP engine, the initials AJW originating from its designer, A.J. Wheaton. AJW: Founded by Arthur John Wheaton. Assembled motorcycles from other companies' engines, gearboxes and frames on small scale production line. Successful through the 1930s, but production halted during WW2 and didn't restart until 1948 when the firm changed hands. Made several bikes with the name 'Fox' - Grey Fox, Silver Fox, Silver Vixen, Vixen, Flying Vixen and Speed Fox among others, ranging from 172 to 994cc. 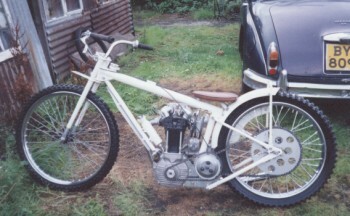 Last model was the 1953 125cc Fox Cub (See below) when supply of JAP engines dried up. 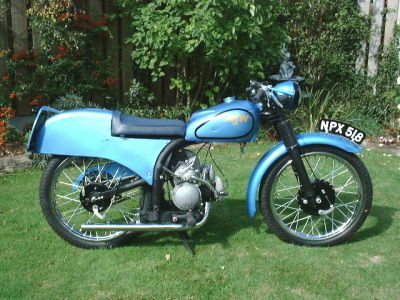 Company returned in 1958 with another Fox Cub, a 48cc, and continued to sell it until 1964. The company returned to make a range of 50, 80 and 125cc Italian-made two-stroke Wolfhound machines in 1976. There are four known variations of the AJW. Type 2: Dated 1949/50. On this particular type there is NO saddle down-tube (the one under the seat). Type 3: Dated 1951/52 and is the model shown in the pictures below. Type 4: Dated 1951/52 and has a conventional styled fuel tank. Pictured: Images of the Type 3 recently restored by speedway & grass track bike collector Noel Clark from Chaddesley Corbet. A novel feature is of this particular type is that the top tube of the frame forms a "sprint" methanol tank. 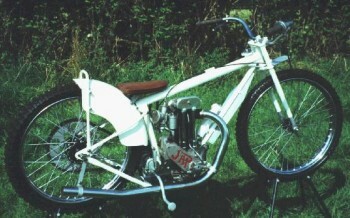 This Speedfox was made by AJW motorcycles in Wimborne Dorset. Reportedly, only about 15 of the AJW's were built between 1949-53 though this needs to be confirmed and the only other ones known to be remaining are two in a private museum in Sweden. An interesting photo sent to me that shows (From left to Right): Jack Young, Fred Jolly and an Emu bird. This particular AJW looks somewhat different from the 4 types mentioned above, though the frame would be that of the type 4 machine. Pictured (Below) are photographs kindly sent to me by Bennie Ludolphy of yet another AJW machine. This AJW is with a more or less normal frame, but please note, there is no saddle down tube. On top of the cylinder head is a bracket for mounting it to the top frame tube. This machine is one that is on display in a museum in Sweden. 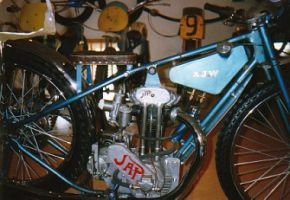 Having viewed your web page on AJW Speed Fox I thought you might be interested to see this shot of my 1952 AJW Fox Cub 125cc 2-stroke prototype JAP engined. I saw that you mentioned it on your page. This is obviously a Jack Ball bike and should have come into production after the 70 Grey Foxes that he built, along with its prototype big brother Flying Fox, 500cc JAP engined, in the same frame. As you say due to lack of engines they went no further. I have a collection of several AJWs , mainly of Exeter origin, including Flying Foxes, Red Fox and Flying Vixen. I also have a Whippet and the prototype Fox Cub of Jack Ball's. Many thanks for the additional information Roy, who incidentally hopes at some stage to have his own AJW Web Page - we look forward to linking to it Roy. In the meantime, anyone wishing to contact Roy can do so at RKDJ@wheatonr.fsnet.co.uk.